"While it is true that millions of computer owners are now online, it simply isn't true they are just sitting there eagerly waiting to send you money the moment you contact them (in fact it is harder to get someone to buy on the Internet than in a normal business environment)." The average visitor-to-sales conversion for a good affiliate program is between half and one percent. In other words, you are achieving an average 'conversion rate' if you make 1 sale for every hundred visitors you send to a merchant's site. Quite frankly, I think that's dismal. You CAN do much better than that. My conversion rates average between 2.5 and 6 percent, and many are much higher depending on the type of product sold. 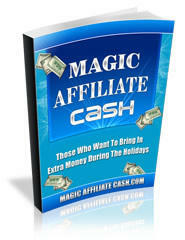 To start with, I consistently follow my own rules in 'How to Choose Affiliate Programs' above. I always give the product or service 'added value' by creating content around it. I tell my customers exactly why I think it's a good product or service. If it has a few drawbacks, but I still think it's a good buy, I'll tell them that too. As I mentioned above, I often purchase and test products before offering them to my visitors. I do this after I've joined the program, and when I can, I use my own affiliate link to buy the item. The price is then reduced by the amount of commission I receive from the sale. The cost is also a business write-off. As a consumer, I give my customers enough information about the product to help them decide whether or not it is right for them, which gives me a big leg up on the competition.